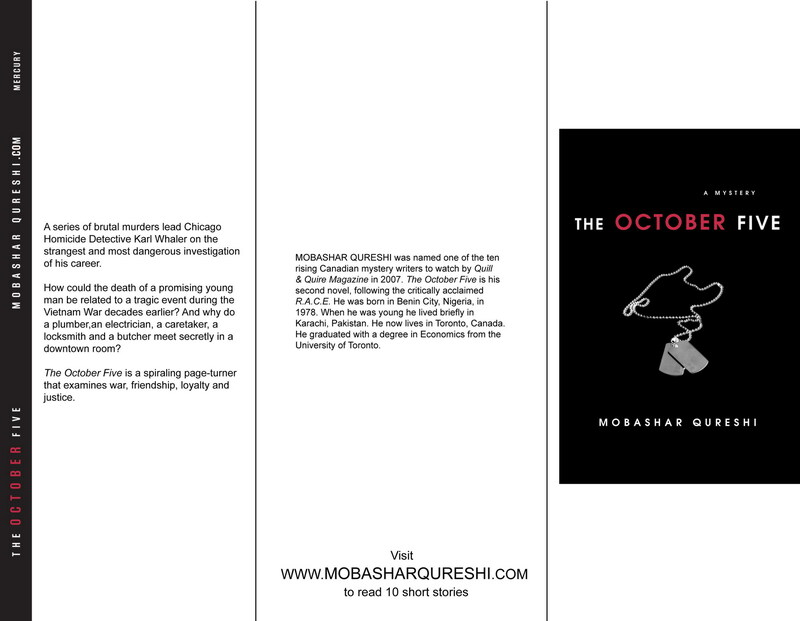 A series of brutal murders lead Chicago Homicide Detective Karl Whaler on the strangest and most dangerous investigation of his career. How could the death of a promising young man be related to a tragic event during the Vietnam War decades earlier? 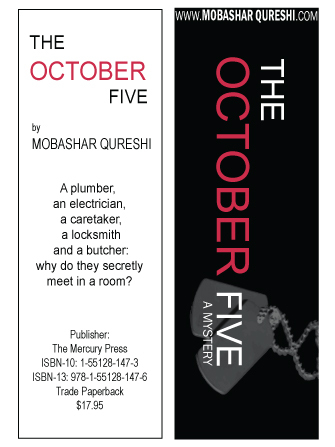 And why do a plumber, an electrician, a caretaker, a locksmith and a butcher meet secretly in a downtown room? 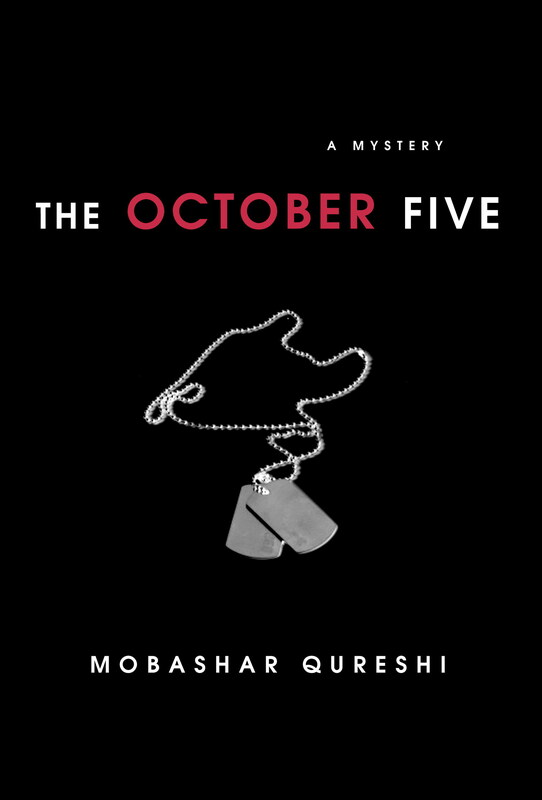 The October Five is a spiraling page-turner that examines war, friendship, loyalty and justice. How could the death of a promising young man be related to a tragic event during the Vietnam War decades earlier? 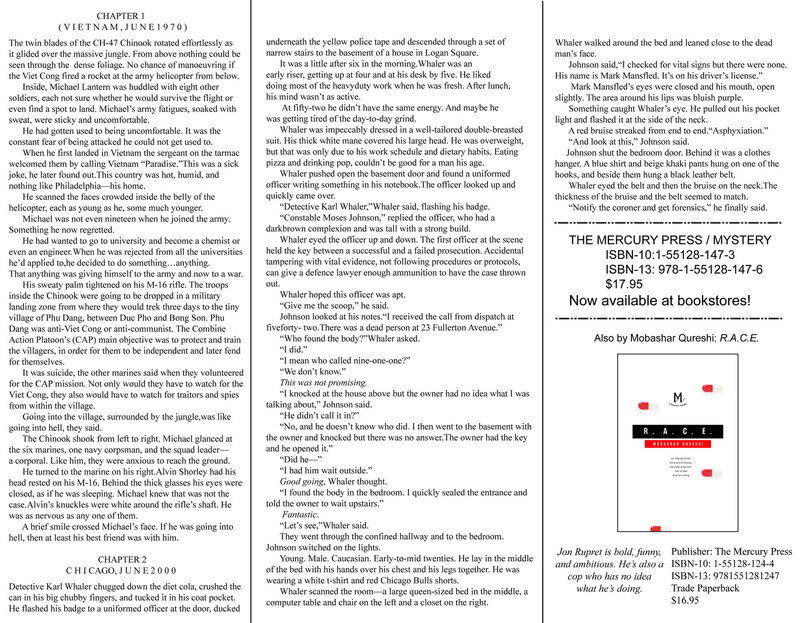 And why do a plumber,an electrician, a caretaker, a locksmith and a butcher meet secretly in a downtown room? The twin blades of the CH-47 Chinook rotated effortlessly as it glided over the massive jungle. From above nothing could be seen through the dense foliage. No chance of manoeuvring if the Viet Cong fired a rocket at the army helicopter from below. Inside, Michael Lantern was huddled with eight other soldiers, each not sure whether he would survive the flight or even find a spot to land. Michael’s army fatigues, soaked with sweat, were sticky and uncomfortable. He had gotten used to being uncomfortable. It was the constant fear of being attacked he could not get used to. When he first landed in Vietnam the sergeant on the tarmac welcomed them by calling Vietnam “Paradise.” This was a sick joke, he later found out. This country was hot, humid, and nothing like Philadelphia—his home. He scanned the faces crowded inside the belly of the helicopter, each as young as he, some much younger. Michael was not even nineteen when he joined the army. Something he now regretted. He had wanted to go to university and become a chemist or even an engineer. When he was rejected from all the universities he’d applied to, he decided to do something…anything. That anything was giving himself to the army and now to a war. His sweaty palm tightened on his M-16 rifle. The troops inside the Chinook were going to be dropped in a military landing zone from where they would trek three days to the tiny village of Phu Dang, between Duc Pho and Bong Son. Phu Dang was anti-Viet Cong or anti-communist. It was suicide, the other marines said when they volunteered for the CAP mission. Not only would they have to watch for the Viet Cong, they also would have to watch for traitors and spies from within the village. The Chinook shook from left to right. 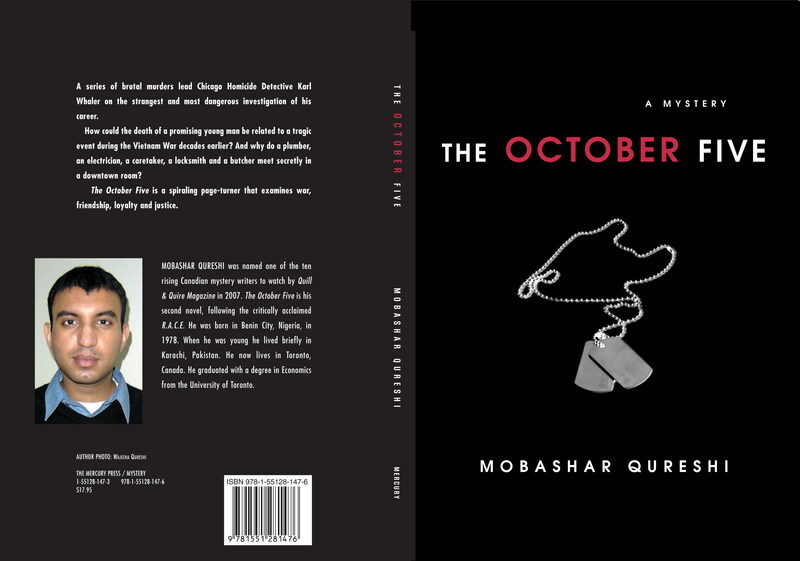 Michael glanced at the six marines, one navy corpsman, and the squad leader—a corporal. Like him, they were anxious to reach the ground. He turned to the marine on his right.Alvin Shorley had his head rested on his M-16. Behind the thick glasses his eyes were closed, as if he was sleeping. Michael knew that was not the case. Alvin’s knuckles were white around the rifle’s shaft. He was as nervous as any one of them. least his best friend was with him. Detective Karl Whaler chugged down the diet cola, crushed the can in his big chubby fingers, and tucked it in his coat pocket. He flashed his badge to a uniformed officer at the door, ducked underneath the yellow police tape and descended through a set of narrow stairs to the basement of a house in Logan Square. It was a little after six in the morning. Whaler was an early riser, getting up at four and at his desk by five. He liked doing most of the heavy duty work when he was fresh. After lunch, his mind wasn’t as active. At fifty-two he didn’t have the same energy. And maybe he was getting tired of the day-to-day grind. Whaler was impeccably dressed in a well-tailored double-breasted suit. His thick white mane covered his large head. He was overweight, but that was only due to his work schedule and dietary habits. Eating pizza and drinking pop, couldn’t be good for a man his age. Whaler pushed open the basement door and found a uniformed officer writing something in his notebook. The officer looked up and quickly came over. “Detective Karl Whaler,”Whaler said, flashing his badge. “Constable Moses Johnson,” replied the officer, who had a dark brown complexion and was tall with a strong build. Whaler eyed the officer up and down. The first officer at the scene held the key between a successful and a failed prosecution. Accidental tampering with vital evidence, not following procedures or protocols, can give a defence lawyer enough ammunition to have the case thrown out. Whaler hoped this officer was apt. “Give me the scoop,” he said. “Who found the body?”Whaler asked. “I knocked at the house above but the owner had no idea what I was talking about,” Johnson said. They went through the confined hallway and to the bedroom. Johnson switched on the lights. Young. Male. Caucasian. Early-to-mid twenties. He lay in the middle of the bed with his hands over his chest and his legs together. He was wearing a white t-shirt and red Chicago Bulls shorts. Whaler scanned the room—a large queen-sized bed in the middle, a computer table and chair on the left and a closet on the right. Whaler walked around the bed and leaned close to the dead man’s face. Mark Mansfled’s eyes were closed and his mouth, open slightly. The area around his lips was bluish purple. Something caught Whaler’s eye. He pulled out his pocket light and flashed it at the side of the neck. “And look at this,” Johnson said. Johnson shut the bedroom door. Behind it was a clothes hanger. A blue shirt and beige khaki pants hung on one of the hooks, and beside them hung a black leather belt. Whaler eyed the belt and then the bruise on the neck. The thickness of the bruise and the belt seemed to match. “Notify the coroner and get forensics,” he finally said.